Did you know – Our rivers, wetlands and fish populations are under stress? Quite simply, as a nation, we are abusing the aquatic environment: sedimentation from poor land management, intensive aquaculture, excessive water abstraction, diffuse and point source pollution, and man-made obstructions are just some of the factors that individually and collectively have contributed to the decline. The plight of the water vole is well documented but it is not alone in its struggle for survival. In many rivers, the iconic salmon runs have collapsed by as much as 80% over the last 20 years and many now fail conservation targets. Aquatic fly populations (food for fish and birds) are also down by as much as 70%, and water plants are similarly suffering. The Government’s own assessment indicates just 23% of rivers in England & Wales meet the test of “good ecological status”. Yet most people are unaware of this damning statistic, which sadly includes chalkstreams – England has responsibility for 85% of the World’s resource of this fragile habitat. S&TCUK believes that the decline can be reversed, but immediate action is required if we are to preserve our aquatic habitats and dependent species for future generations. When the Salmon & Trout Conservation UK was formed in 1903, the principal threat to freshwater and marine habitats came from industrial pollution. 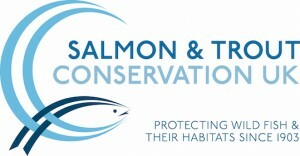 The Association began to recruit members and took shape from the concept that, ‘it is necessary for sportsmen, scientists, experts in each branch of fishery care and administration to band themselves together to protect and nurture a natural heritage that civilisation dissipates.’ S&TCUK became a registered charity in 2008 and is now the only UK fisheries charity that campaigns for the conservation, protection and sustainable management of an aquatic environment capable of supporting an abundance of indigenous fish species, invertebrates, animals and plant life – from source to sea. A healthy river is aesthetically beautiful and has benefits for public health, physical and mental well being, and is an integral part of human social and cultural activity. It is also vital for local economies, particularly among small rural businesses, many of which are in remote locations and rely upon the tourism generated by rivers and wetlands. We also have a moral responsibility to ensure that our rivers and wetlands are protected for future generations, and S&TCUK regards this as its primary responsibility.